With over 3,000 sq. 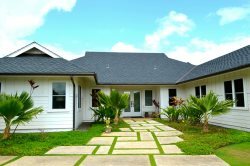 feet of breezy living and sleeping space and a private backyard oasis both kids and adults will love, this stunning, ranch-style home is the ideal island getaway to build lasting memories with your ohana. Slide open the wall of glass doors, kick back on the sofa, and let tropical breezes flow through the open living room while everyone catches up. The kids will love splashing around in the outdoor pool while the adults work on their tan. Grill up lunch on the gas grill and serve it picnic style or at the outdoor lanai table. At night, the living room is perfect for hosting family movie nights on the flat-screen cable Smart TV. The remodeled, open-concept kitchen and dining area is equipped to handle any meal, featuring stainless steel appliances, a granite island, and a dining table to fit the group. Three spacious bedrooms, a den, and a sleeper sofa sleep up to 12 in two king-size beds, three queen-size beds, and queen-size futon. Three full bathrooms make sharing space easy, including an impressive en-suite master with a sunken tub and massive walk-in shower. For those who prefer a bit more privacy, the detached guesthouse studio sleeps two in a queen-sized murphy bed and includes a full bath, kitchen, and laundry area. With its own wrap-around lanai, you can enjoy peaceful ocean views with your morning coffee before meeting up with the group. For larger groups, the Makanui Bungalow next door sleeps five, and can be rented alongside Lei Ohana to accommodate up to 17. 1. A Private Oasis: Beat the crowds and the heat with your own private outdoor pool set in a fenced in yard with gorgeous tropical landscaping and peeks of mountain views. 2. Great for the Group: With room in the main house to sleep 12, a private guesthouse studio for two, and plenty of communal space for spreading out or coming together, Lei Ohana is perfect for multi-family gatherings or group travel. 3. Proximity to Fun: Snorkeling, whale watching, beachside sunsets, and lanai dining at Brenneke’s or Poipu Beach are just a few of many attractions within a 10-15 minute walk from this home-away-from-home. Private Pool -- The pool is approximately 45'x12' 4' depth. 41/2' depth in middle of pool. The Makanui Bungalow is a two-story guest house that sleeps 5. It is located right next door. It is a separate property that is also available for rent. Such an amazing house and great location. The yard and pool are so nice to have and such a gem too. I had my wedding here and great vacations was able to help me secure the surrounding properties as well as others close by so all my friends and family were either on the property or a stone throw away. it was truly so special. Great vacations were very accommodating and hospital. The only weird thing that happened was that the actual owner of the house (not someone from great vacations), came in while just my mom and aunt were there and made them very uneasy and uncomfortable as he pushed himself inside. He continued to look around the place, checking out our stuff. He and his wife were staying in this closed off room on the first floor of the guest house and continued to watch us like hawks for the remainder of our stay which thankfully we were at the end of our trip. After talking to great vacations, it seems like it was an isolated event and not part of their protocol so I wont let it effect my 5 star review. We had issues with the sliding doors, cleanliness of the floors, windows and dishes when we arrived but they sent the cleaner back to clean the floors and dishes the next day, the window cleaners and maintenance crew the next day. After that hiccup, we were super happy with the place. The location is super. The communal areas were spacious. Plenty of special places and nooks to make fun and memorable times with your family and friends. After spending the day at the beach, we couldn't wait to go back to the house and jump in the pool. We were also super impressed with the responsiveness of the management. They really do care about the happiness and satisfaction of their guest. We were sad to leave and would definitely book this place again. This was a wonderful home. We had 11 of our family together. The open floor plan made it great to feel together as a family. The landscaping was incredible with many beautiful flowers and trees. The location was excellent, very near beaches and a very nice beachside walking trail. Having the swimming pool was awesome and refreshing. Very happy with this location and the amenities. The pictures are beautiful, but cannot really cannot do it justice. MANAGER'S RESPONSE: We are so glad you enjoyed Lei Ohana. The property is amazing and such a great place for large family or friend gatherings. We hope you can come back again some day! Thanks for your help in a super successful family reunion. We would stay here again any time. Thank you to the owners for their generous supplies in bath and kitchen. We replaced when necessary . We had a great time, close to the beach . Great place to just relax! We communicated a couple of times with your team members prior to our arrival. I received prompt attention to my emails and phone calls. I felt that your team members were very, very helpful in handling questions and concerns. We were to be a party of 11 family members, so there were many questions to be answered. Your team members were able to streamline the arrival information and directions so we could distribute the information as simply as possible. I enjoyed receiving the information on the house. I knew in advance what would be expected and provided. MANAGER RESPONSE Mahalo! We are so happy to help and glad you enjoyed the property. Hopefully you can make it back again soon! Our family enjoyed every moment of our stay at the Lei Ohana House & the Guest House. Please, do not hesitate to book this house immediately. You will not be disappointed! All 11 of us (10 adults & 1 ten year old) were very comfortable in the house and the property is so spacious and beautiful. The private pool was a bonus. Our family wanted to spend our time together, and the Lei Ohana House provided us with the comfort level we were looking for! The accommodations were lovely, so don't delay in booking it! MANAGER RESPONSE: Mahalo! What a nice review. Thanks for being great guests! This property is amazing! It is very large and accommodated our family and friends for our wedding week in Kauai! Great Vacation Rentals makes the booking process easy and they are extremely friendly and nice. We already look forward to our next trip here and would definitely book this property again! Thank you!!! Convenient location and huge house for our big group of friends! We loved it! Great customer service! Issues with tv remote resolved promptly. New grill installed. Very nice. Very responsive to requests, pool and yard serviced while we were there. GVR was great! Appreciated having laundry detergent, dishwasher detergent, soap, paper towels, toilet tissue, plastic garbage bags all supplied in sufficient quantities that we did not have to buy any additional items. Bruce was wonderful in the reservation process. So helpful, fun and understanding! He always answered emails immediately and was very reassuring and helpful in answering all questions! From our first moment of driving up to the property to our last glimpse of it driving away, we were enchanted with the beauty and comfort of the house, decor and provisions. All the decorating touches spoke of love and beauty from the gorgeous wood furniture to the lovely pictures on the walls - all very personal...nothing generic. Wow! The openness of the house (glass folding wall to the pool) and the beauty of the pool area, blue tile work all around the edge of the pool, lots of pool and beach toys, towels and supplies made our stay relaxing and happy. The spacious yard, the flowers, the creative landscaping, the little reading nook by the pool, the generous wood outdoor table for dining, the charming stepping stones, trees and secret spots for the children to run and play, complete privacy and beauty everywhere one looked all contributed to our complete happiness and satisfaction with the property. A real gem. The master bedroom suite is like something out of a dream. The beautiful wooden bed and antique furnishings, lovely sheets, windows and doors open to the lovely breezes, a master bath with all tiled shower and deep bath (hot tub with sitting shelf) all open to the windows and door (no shower curtain needed and a little rock garden) made showering and bathing a lovely experience. Fortunate is the family who decides to rent this house:) Well worth the money! Thank you for sharing this with us! MANAGER RESPONSE: Awe, thank you so much for your review. It makes us so happy to hear our guests stories and know they had a truly amazing experience. The owners of Lei Ohana are amazing people and take such great care of their home. They will be pleased you enjoyed it. We appreciate your taking the time to leave a review and hope to see you again! The place was great. The pool was a great hit with all. It is spacious and nicely appointed. Lovely home with ample room for our group of 9 - the guest house was an added bonus. Would have liked air conditioning to make sleeping more comfortable and retractable screen door to lanai to enable a nice cross breeze at night. Bruce, Mark and Janie were great. We all - 3 generations- had a wonderful time at Lei Ohana. From the moment we arrived late from our East Coast flights to star gazing - low lights a plus - to waking up to the sunrise and beautiful gardens, we knew this was a perfect fit. The house was a wonderful location for hiking, running, golfing, beaching, surfing... We all found our own spaces when needed with teens but then we were able to gather together and enjoy fun dinners cooking in the super kitchen and with the grilll. So little to fault . Work on the pool light and the door security : both high concerns for safety and security. Wish we could return soon but we will be off to another destination in our bucket list. Hope our review brings many happy families. MAL Denver, NC MANAGER RESPONSE: Many mahalos for posting a review. It means so much for future guests to hear about past guests experiences;) Hope you enjoy the next destination on your bucket list and that someday you make it back to Kauai! We enjoy Lei Ohana because it is private with a great kid sized pool and close to the beach in sunny Poipu. From the moment we arrived we loved the property. It was beautiful, comfortable, well-maintained and perfect for relaxing with our family!